Horizon Safety Systems also offer a full range of fire extinguishing equipment, from the hand held portable fire extinguisher to the fire hose reels. As well as the supply of the portable fire extinguishing equipment, we can provide the client with a design criteria for the required number of extinguishers for your relevant building and the type and size of fire extinguisher needed. AFFF (Aqueous film forming foam) Fire extinguishers are a must for any office environment. The dual A and B rating capability allow it to be used against both solid burning and liquid burning fires. This coupled with the fact that they have a conductivity rating of 35kV means that although not designed for use on electrical fires – this extinguisher resists electricity. 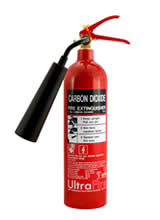 Carbon Dioxide (CO2) based fire extinguishers are primarily used for fighting electrical fires. The liquid CO2 dissipates cleanly into the atmosphere after the fire has been extinguished. The extinguishers are made from drawn aluminium to reduce the weight of the can and they are supplied with a plastic applicator to direct the CO2 to the target area. ABC Powder fire extinguishers have been used in a variety of scenarios for many years. The versatility of the mono-ammonium phosphate extinguishant, combined with tremendous fire knockdown capabilities have made the powder extinguisher one of the best fire extinguishers to use in almost all circumstances. Water fire extinguishers are only suitable for Class A (solid burning) fires. Using water to cool and therefore extinguish the fire is the simplest way to combat fires. Supplied with a jet spray nozzle our water fire extinguishers have one of the highest A ratings available in the fire extinguisher market today. WET CHEMICAL FIRE EXTINGUISHERS are especially designed for tackling cooking oil / deep fat fryer (Class F) fires, but also have an effective capability for extinguishing Class A fires (wood, paper, straw, textiles, coal etc.). This extinguisher has also passed the electrical conductivity test at 35kv. Wet Chemical fire extinguishers are the only extinguisher on the market today that can be safely used on class F (Deep fat fryer) fires. Supplied with a unique applicator to allow the user to stay a safe distance from the fire at all times. Also capable of combating class A (solid burning) fires this extinguisher is perfect for any catering establishment that involves the use of deep fat fryers.